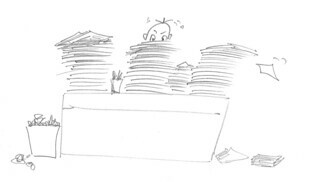 A messy desk may be the hallmark of a brilliant mind, but having to wade through stacks of paper every time you need something can be time consuming and frustrating. By switching to a paperless system, firms save space, time, and money. However, making the jump can sometimes be a frightening prospect. In addition to the obvious environmental benefits, going paperless is cheaper than continuing to use paper. Firms no longer have to buy paper, purchase toner, keep file cabinets, repair fax machines, or rent the space to store these items. Thanks to cloud storage, lawyers don’t have to worry about having the hardware or servers on hand to digitally store their documents either–they can rent all of the virtual space that they need, and they can easily expand that space as their needs grow. In spite of these advantages, however, many firms are refusing to make the leap. According to the American Bar Association, lawyers, assuming that the transition will be yet another stressful task on an already full plate, are often overwhelmed by the idea. Their fear of the unknown stops them from embracing a system that would save them money and make their offices run more efficiently. Once a digital system is in place, lawyers no longer have to spend hours looking for an errant file or a misplaced document. Even if something slips through the virtual cracks, it can be retrieved by a digital search. As an added bonus, a digital system can be easily organized, meaning that lawyers don’t have to foot the bill for a file clerk. Security is also enhanced when firms switch from paper-based to a paperless system. When a lawyer files a client’s case notes in a filing cabinet, anyone with a key can access it. Digital filing systems, in contrast, can be protected with dual authentication passwords and other security measures. This added security can be leveraged to maintain or attract clients who are specially concerned about maintaining the client-attorney privilege. Portability is another reason why many law firms have decided to take the leap into paperless systems. Many document management systems can be configured to work remotely as well as in the office. That means that if a client catches you while you are on the road, attending a child’s soccer game, or otherwise out of the office, you can easily access their notes through your laptop or via a smartphone app. By improving client relationships in this way, you safeguard your reputation and boost client satisfaction rates. There are countless practical considerations that need to be made along the way. Lawyers need to decide how many files they are going to convert to a digital format, and they have to decide how to deal with incoming mail. Additionally, they must create a digital signature and decide what they want to do with their printer. To help soothe the transition, check out our recent webinar with Ernie Svenson (aka Ernie the Attorney): Creating a Paperless Office (recap). The one hour webinar covered the essentials that you need to understand before you shredding the paper at your firm. In addition to covering practical topics like how to store and manage digital documents, Svenson also addressed prevailing myths like the idea that paperless is not paper-free.